Lightly spray mold with baking spray. Place it on top of a baking pan to make transfer to fridge easier. Empty packets of unflavored gelatin into a small bowl, add 2 tablespoons with warm water; stir. In a saucepan, add the caramel sauce, brown sugar, vanilla extract, molasses and 1 cup warm water. Add the now solid gelatin mixture to the pan; stir until dissolved. Let cool for a few minutes and then add the bourbon. Carefully pour into prepared molds. Leave a little room on top so you can add pecans without it spilling over. Divide chopped pecans among the pie shots. Refrigerate. Once firm, carefully remove from molds. If they are hard to remove, dip (DO NOT submerge) into a pan of warm water. If desired, top with whipped cream and candied pecans. Instead of serving the same ol’, same ol’ this Thanksgiving, why not freshen things up and really get your holiday in full swing? This year shake up your dessert table and offer your adult guests some pie gone wild… Pecan Pie Jelly Shots, Cranberry Orange Pie Jelly Shots, and French Silk Pie Jelly Shots. Amongst the real pies offer up these fun pie-shaped Jelly shots to add some extra spirit to your gathering. While you could skip the pie mold shape, I do think it adds an extra element of festiveness. I used a mini tart pan mold, but they are pretty large for a shot. So I chose to serve them in wedges, just like you would regular pie. If you want less of a kick, go for the Cranberry Orange shot. 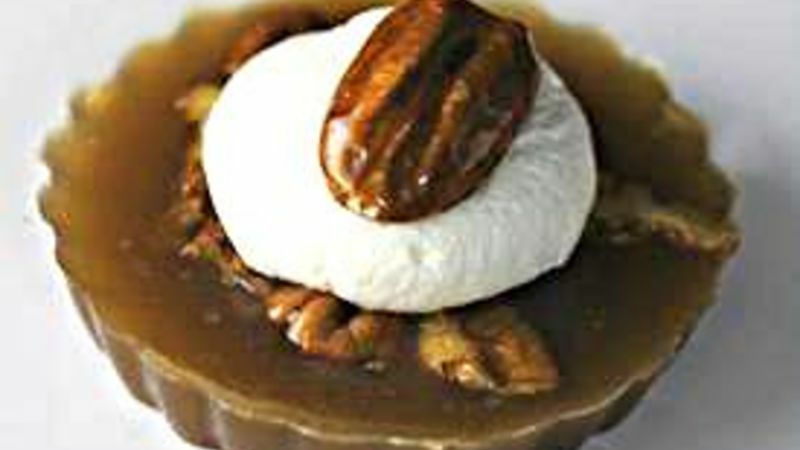 But if you love bourbon, the Pecan Pie jelly shot will definitely get you feeling good quickly. And for the chocolate lovers out there, gotta have the French Silk Pie jelly shot. In a saucepan, add the caramel sauce, brown sugar, vanilla extract, molasses and 1 cup warm water. Heat, but do not boil. Add the solid gelatin mixture to the pan, stir until dissolved. Allow to cool a few minutes, then add the booze! Pour into the mold, add pecans and chill. If desired, cut into pie wedges and top with whipped cream and candied pecans. In a saucepan, pour water and sprinkle gelatin. Stir over low heat until gelatin is dissolved. Add the cream and mix. Then add the sugar and cocoa. Strain the mixture, while pouring into the mold. Don't fill them too full, so you have room for adding toppings. Chill. In a medium saucepan, bring the cranberry juice and whole cranberry sauce to a boil. Transfer to a medium mixing bowl and pour in the gelatin. Stir until gelatin is completely dissolved. Pour into molds and chill! If desired, top with whipped cream and orange zest. So no matter which one you try (or maybe all three!) you will be sure to treat your guest to a fun boozy dessert surprise! Peabody loves ice hockey (she plays!) and all things baking! Check out her great stuff at her blog site Culinary Concoctions by Peabody and her Tablespoon profile. Her teammates love when she brings the extra jelly shots for after the game.